Giant wasps? Yeah, there could've been something there. Giant bunny rabbits? Not so much. The biggest mystery is how this movie ever got past the idea stage of development. Didn't someone, somewhere say "that's ridiculous, that could never work"? Not the screenwriter, not the director, not the people who financed it, not the cast, not the script girl, not the caterer....no one? The mind reels. 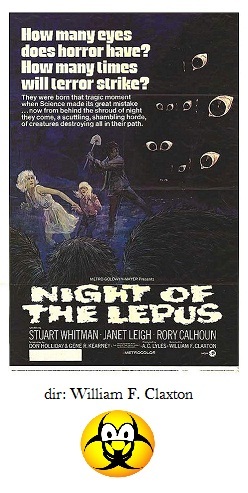 Sadly, Night of the Lepus became a reality; so forever minted on film is poor Janet Leigh (Psycho) and DeForest Kelley (Star Trek) battling giant bunnies. In the desert, Leigh and fellow scientist Stuart Whitman, are trying to curb the local rabbit population by, you guessed it, injecting them with a serum, and no guesses needed on what happens after that. The bunnies grow to humongous size, hippity-hopping across toy buildings and occasionally chowing down on the townsfolk; needless to say, the slow-motion shots of angry, frothing, bunny faces do not instill the kind of terror into the hearts of the audience that the film makers intended. It's more like instilling the audience with the slow realization that, yes, we will watch anything because here is the proof. Levity would've been this movie's best friend, but for whatever reason, director William F. Claxton (who languished in TV Hell for the remainder of his career) plunks down scene after scene with deadly seriousness despite the idiocy abounding. The actors perform as if by gunpoint and who can blame them? If your career has led you here, then there is some serious personal inventorying to be done.